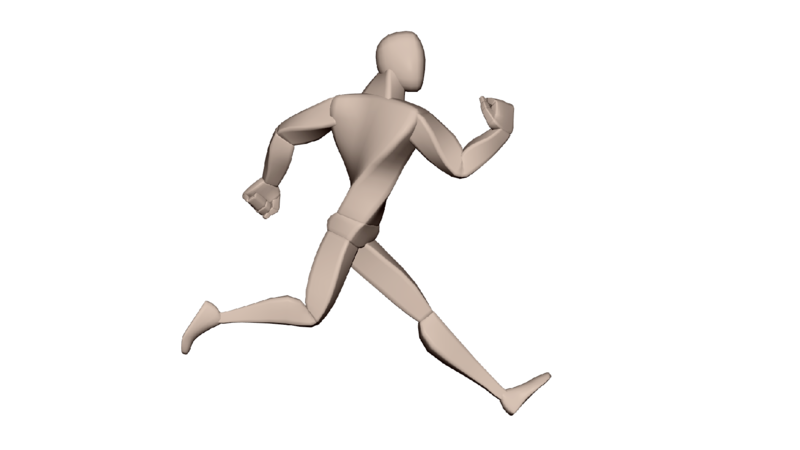 A run cycle is very similar to a walk cycle. The key poses and general locomotion is all roughly the same – just pushed. Pushing timing, pushed spacing, pushed posing. This definitely helps define a run – as a run. But what truly separates a run from a walk is that for at least 2 frames both feet will be in the air at some point. So all we have to do is incorporate this into the poses and adopt the same workflow as in the walk cycle tutorial – a layered/pose to pose workflow. A layered/pose to pose workflow means we’ll be first roughing in our animation with 1 key pose at a time while in spline. Then once our keys are in place we’ll work on 1 body part at a time ( layering ) until its all polished. The sections below will walk you through these 7 steps. Though you’ll probably understand everything best if you review these steps after you’ve watched the free run cycle video tutorial. 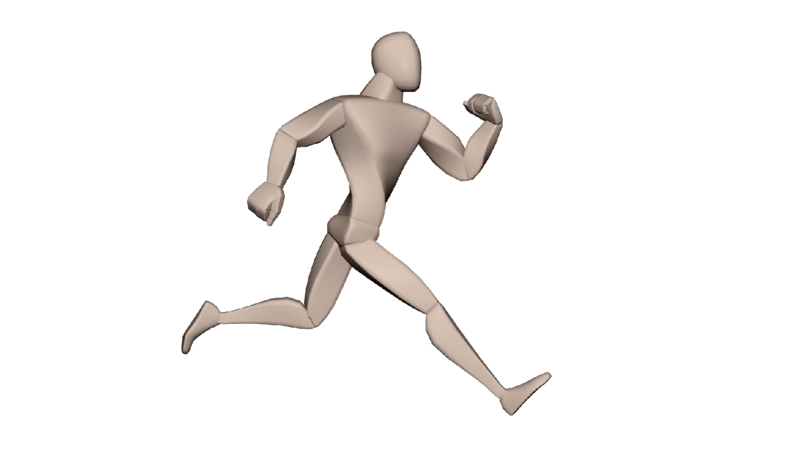 Like the walk cycle tutorial, the starting point for our run cycle is the contact pose. However, the body will lean forward and twist far more with a greater stride length. And most importantly, both feet will be in the air for this pose. We’ll also establish how fast this run is going to be with our contact poses. A run’s speed can vary a lot. You could make a super fast 2 frame cartoony run, or you could have your run be even slower than a normal walk. But for this run will be on 8s (8 frames a step). The down pose, is exactly what it sounds like. It’s the lowest vertical point where the leading foot takes the weight. The up pose in a normal run establishes our airborne hang time. Both feet will be in the air as the character reaches its highest vertical point. With all the key poses set, your ready to start offsetting the rotations on your controls. This means your rotate x, y, and z won’t be all keyed on the same timing. Ex. the entire hip rotate x curve is slid 2 frames later- while the y is slide 1 frame earlier. It’s an easy way to get a natural feel to your movements by creating figure 8’s. The arms and legs are roughly setup from your key poses but you have to set some in between keys to make the locomotion better. Toning down or exaggerating any part of your animation should probably come first. Make sure the overall movement feels like you want it to feel before spending a bunch of time on something small like Toe Overlap. Next, make sure to get rid of any eye sores like knee pops, wall smacks, or floatyness. Then the rest of the polish phase you can bounce around to add or tweak whatever you want. Want to know about the Best Animation Schools?